After winning ASCE’s 2017 Pankow Award for Innovation, interest in this portable, fast, and accurate bridge load-bearing-capacity assessment tool hasn’t waned. 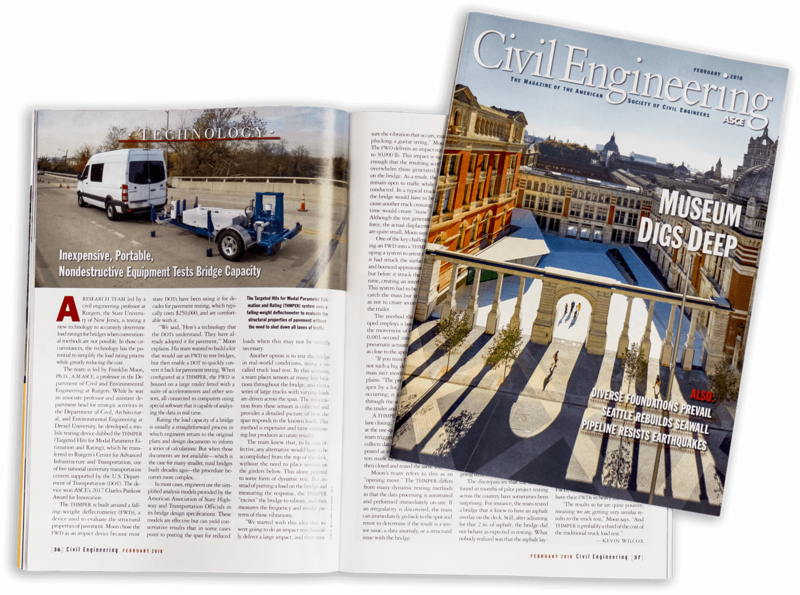 Civil Engineering (CE) magazine featured it on a spread in the February 2018 issue and covered the genesis and benefits of THMPER. Drs. Franklin Moon, John DeVitis, David Masceri, and Emin Aktan collaborated on the invention. In general, engineers currently determine load capacity by doing a series of calculations based on original plans and design documents. But when those documents aren’t available—as is the case with many small, rural, and/or old bridges—engineers have to use simplified analysis models provided in the AASHTO bridge design specifications. These simplified models frequently produce conservative estimates that may not reflect a bridge’s full load-bearing capacity. Another option is live load testing, but that is both time consuming and expensive. The FWD is housed on a trailer that is outfitted with accelerometers and other sensors connected to computers in the command van that automate the data processing so the THMPER team can analyze data in real time. “Data about the frequency of the vibrations and the shapes the bridge assumes at which frequencies reveal important performance measures related to stiffness and mass, which in turn tell us how truck loads are distributed to key elements,” Moon explains. 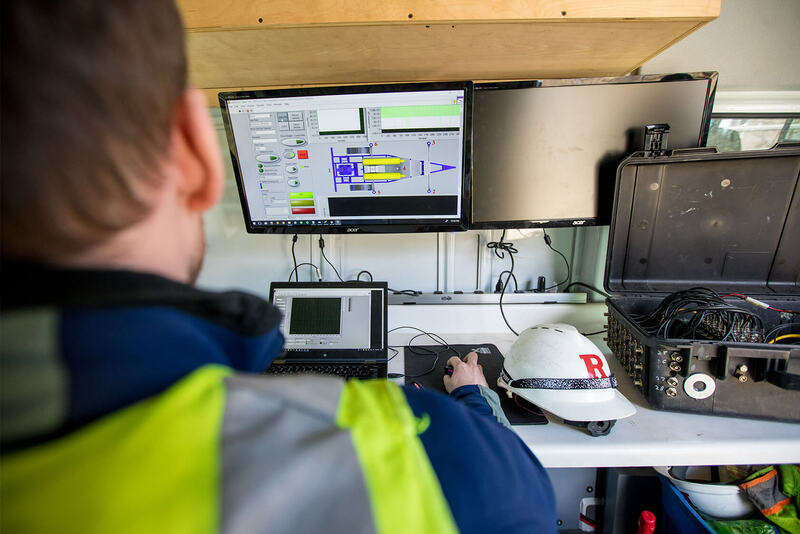 With on-site analysis, if they spot an irregularity during testing, they can immediately retest the spot to determine if it’s a sensor or transmission malfunction, a data anomaly, or a structural issue. A key challenge in making THMPER’s FWD work was devising a system to stop the drop weight during its bounce, before it hit the bridge a second time. The “braking” system they settled on is robust enough to stop the mass but smooth enough not to cause secondary vibration that would “dirty” the data. A laser sensor tracks the movement of the falling weight and fires two pneumatic actuators that arrest the mass as close to its apex as possible. “If you miss the apex by a little, it’s not such a big deal because the mass isn’t moving very fast,” Moon explains. “The problem is, if you miss the apex by a lot, then another impact occurs; it just happens to be going through the actuator into the frame of the trailer and then through the tires. “The FWD delivers an impact equivalent to 30,000 pounds … significant enough that the resulting accelerations overwhelm any vibrations generated by traffic. In a typical truck-load test, the bridge has to be closed because, in the event another truck crosses at the same time as the test truck, it can cause ‘noise’ in the data,” Moon says. THMPER’s accuracy is attributed to modal impact testing, refined analysis, and calibration of finite element models—all outlined in AASHTO standards. The rapid-testing THMPER is considered groundbreaking because it uses all three of those methods and makes it possible to perform the whole operation on site thanks its portability, rolling data processing lab, and custom software. Its ability to estimate bridge load-ratings accurately, faster, more economically, and with less traffic disruption than conventional methods removes multiple barriers that used to make widely applying more refined methods impractical for bridge owners. THMPER can test a 100-foot three-lane bridge in about 45 minutes and evaluate some estimated 300-plus bridges per year at about 25 percent the cost of current testing methods. It provides quantitative data that accurately represents a bridge’s load capacity and minimizes traffic disruption. 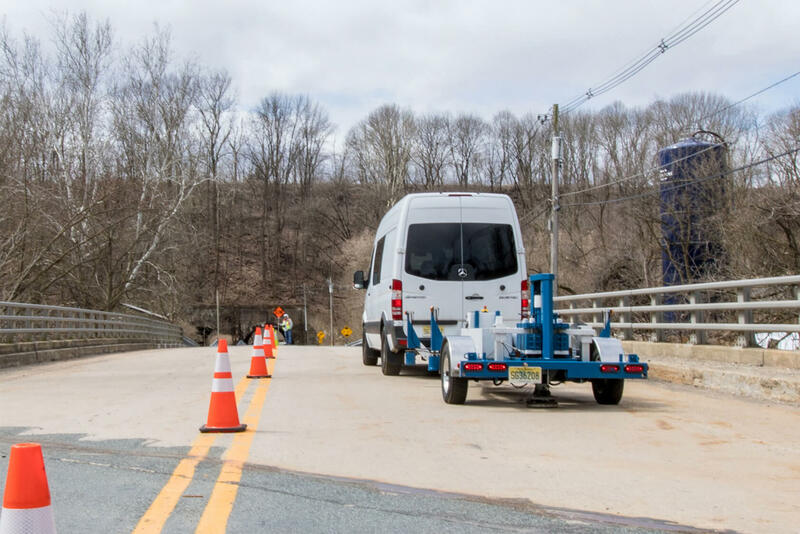 To date, THMPER has been used to assess dozens of bridges in Delaware, Maryland, New Jersey, Pennsylvania, Oregon, and Washington under pilot programs with federal, state, and local transportation agencies. For more information on THMPER or to inquire about testing, contact Dr. Franklin Moon. The THMPER impact trailer “thumps” the bridge, sensors record the vibration response, and computers with custom software aboard the rolling lab process the data on the spot. Faster, cheaper, and with less traffic disruption than other methods, it could revolutionize how bridge load ratings are determined. Photo ©Drew Noel Photography/Rutgers CAIT.